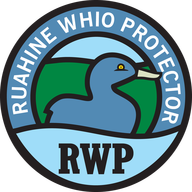 The Ruahine Whio Protectors Trust (RWP) is a collective of community / volunteer groups focused on helping the survival of Whio (blue duck) by carrying out predator control via trap networks. engaging the New Zealand public in conservation of both Whio and the Ruahines. help support and expand the good Whio protection work carried out in the Ruahines for many years now. We work with the Department of Conservation (DOC), and other groups and individuals to help achieve our goals. We have developed a Whio Management Plan to desribe our foci and activities - links to sections of this plan are included on this page. Our vision is to become the largest open sanctuary in New Zealand-a remote coastal landscape where people live, work and holiday; wetlands and forests are regenerating; the bird-song is deafening; and treasured species like kiwi, pateke, bellbird, whitehead thrive.Moehau Environment Group is dedicated to the protection and enhancement of the natural environment of the Northern Coromandel. So far, our work has contributed to the return of the North Island Robin to the Peninsula. Kokako may be next. a) To work for the protection of the natural environment of the Northern Coromandel Peninsula, and in particular the well being of the lands, the waters, and the plant, animal and human populations of the area. b) To engage in education on environmental and related issues, particularly but not exclusively those issues concerning the Northern Coromandel Peninsula. c) To support careful planning for the well being of the lands, the waters, and the plant, animal and human populations of this area. e) To educate; empower and enable members and non-members alike to protect and enhance their natural environment for its own sake and for the health, well being and happiness of all who reside in it.